Ruth Was Our Local "Laura Ingalls"
Our country's westward expansion is taught in every school, and new materials to augment lessons are eagerly sought after. Everyone knows the "Little House on the Prairie" stories, but much less has been written about the 1830's, several decades earlier. Whether used as a read-aloud in class or as supplemental reading for older students, Ruth by Lake and Prairie is a great addition to the classroom or home library. It accurately depicts the day-to-day life of children in the early nineteenth century and introduces the historical figures who populated the early northern Illinois landscape. Both children and adults enjoy this easy-to-read story of twelve-year-old Ruth's journey with her uncle Joseph Naper and a brave group of settlers who sailed from Ohio to Illinois to start new lives on the prairie. 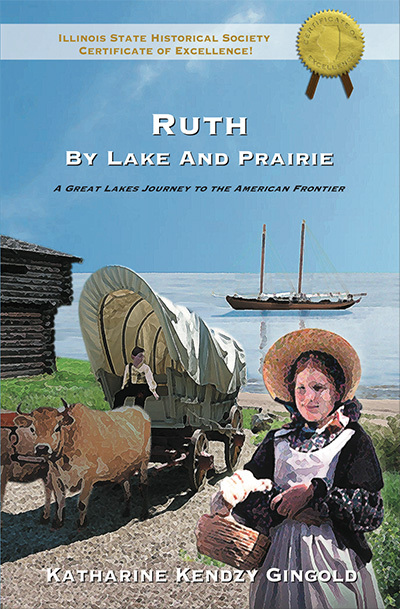 The companion book to the award-winning Ruth by Lake and Prairie is also available. Full of paper crafts to make, recipes, crossword puzzles and word searches, the Ruth by Lake and Prairie Activity Book is a fun way for children to explore the everyday life of the American settler. Order yours today! Or ask your local bookshop to carry them if you want to pick up your copy locally and support your neighborhood merchant.